The Vanbrugh | Pub Quizzers | Find a pub quiz near you, now. 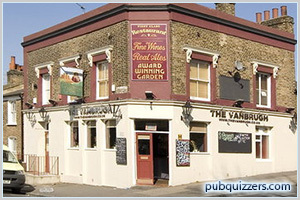 Pub quizzes take place at The Vanbrugh, Greenwich on Mondays (weekly) at 20:30. Entry is £2.00, you can have up to 10 people on a team. There are prizes of cash, drinks, food. Happy quizzing! Famous quizmaster Deke hosts the best weekly pub quiz in Greenwich from 8:30pm. First prize is the entry pot. Second prize is a meal voucher. Very popular night, get there before 7:30pm to get a table.